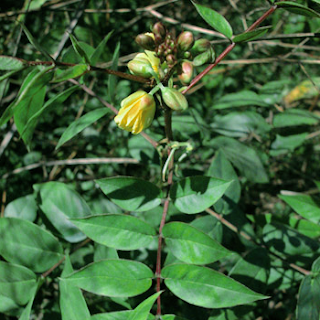 Low shrub, height to 1.5 m. Even-pinnate compound leaves (leaves children without the tip), has 3-7 pairs of strands, narrowed or rounded, green, bright yellow-green. Complete and perfect flowers, count five, single straight. Petals has 5 leaf sheath. Yellow petals with brown veins, 5 pieces, composition shingle. Are sterile stamens (staminodia). Wide elliptical-shaped fruit, sometimes kidney shape, flat, ripe fruit is damaged, 4-7cm long with a width of 2 cm, seed 6-10 respectively. NOT DESIRED EFFECT At long-term use or abuse will result in the loss of electrolytes (especially potassium ion) and can be the cause albuminuria, hematuria, pigment deposition in the intestinal mucosa and damage to the myenteric plexus. CONS INDICATIONS Illeus, intestinal damage, stenosis, Atoni, inflammation, colonopathics, Appendisitis, dehydration status, chronic constipation, pregnant women and nursing mothers, and children under 10 years. INTERACTION Interaction with cardiac glycosides (digitalis, strophanthus) can increase the excretion of potassium ions. At hypokalemia (because laxative use digits long), can enhance the effects of antiarrhythmic drugs (such as whiskers kinidin). The use of other drugs that can cause hypokalaemia as tiazida, adrenokortikosteroid or Liquiritiae Radix can race incidence of electrolyte imbalance. Leaf TOXICITY medical plant senna can cause pain and dermatitis. The main symptoms arearising from the overdose is severe diarrhea, making it possible to lose fluids and electrolytes.